The Canon Pixma Mini 260 is 22.5x22x7.5cm and weights 2.2kilos. It is white with gun metal blue sides. A carry handle pulls out from the back allowing it to be easily moved but this is a mains only unit so the power brick and lead need to come with you. 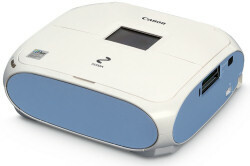 While the unit is supplied with all the normal software you get with a Canon Pixma printer it is possible to use it direct from cameras via the Pict Bridge slot or the four card slots to print direct from camera cards. Just for good measure it also has an infra red port so printing direct from PDA's or phones is also possible. Finally it is possible to print via Bluetooth with an optional adapter. A 15x10cm print can be produced in standard mode in 59seconds. However in best mode - surely this is something you always use for photos - I found it was around 80 seconds per print. Quality was excellent. External connections are on the sides of the unit the power adapter goes into the left side and the two card slots and Pict Bridge slot are on the right. The card types supported are Secure Digital, Memory Stick and Smart Media in one slot and Compact Flash and Micro Drive in the other. Therefore no support for the card type used by Olympus and Fuji the 'xD'. I was also surprised that the 'Pict Bridge' slot does not support pen/flash/stick drives as some such devices do. When you lift the lid of the unit the front falls down to reveal a shelf to guide the finished prints onto your desk. The top fold in two and provides a support for any 15x10cm sheets waiting to be used. There are six button a toggle '+' & '-' button as well as the ubiquitous joystick and surround that actually has nine positions including the central button. The top is dominated by what looks like a 6x4cm display but even when in full screen display it is just less than 5x4cm and that is 2.5inches when measured diagonally. The screen can be tilted up - to nearly 90 degrees - so that you can avoid light falling incorrectly onto it. There are five display options from a soft key Normal, Thumbnail, Full Screen, Enlarged and Slide Show. The other soft key allows you to trim images or to select images from a date or a date range. This is a USB unit (works okay with USB 1.1) and a single cartridge unit that does produce good copies. This of course requires that you give it good images as it has only the cropping option no major enhancement of the original image is possible on the printer. This can of course be down using the excellent Canon software provided on the PC. Reading the specifications I see it is possible to use a battery with this product (optional extra). The unit can print on a variety of media such as stickers or do index pages. It can also print two, four or eight images per page however to my mind this is all window dressing as the media size is still only 15x10cm and eight images on a 15x10cm sheet will of course be very small. Doing my Internet searches found the Canon Pixma Mini 260 at a best price of £74.15 from the first link below.